Jennifer Estep talks Poison Promise and Summer Recipes! A big thanks to Jennifer Estep for stopping by to tell us about her latest book and give us a great recipe to enjoy all year long! Hello! I’m Jennifer Estep, and I write the Elemental Assassin urban fantasy series for Pocket Books. The Elemental Assassin books focus on Gin Blanco, an assassin codenamed the Spider who can control the elements of Ice and Stone. When she’s not busy killing people and righting wrongs, Gin runs a barbecue restaurant called the Pork Pit in the fictional Southern metropolis of Ashland. The city is also home to giants, dwarves, vampires, and elementals – Air, Fire, Ice, and Stone. 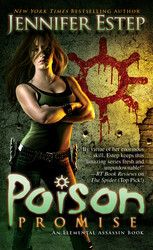 Poison Promise, the 11th book in the series, was released on July 22. Gin has to protect someone who witnesses a horrific crime, so there’s a lot of magic, action, and adventure in to be had here—I hope that everyone has as much fun reading the book as I did writing it. Since she runs a restaurant, Gin loves to cook, and she often whips up dishes for her friends and family in the books. Me? I like to cook too, but I’m all about easy recipes – dishes that you can put together quickly, instead of having to slave over a hot stove for hours. Since we’re in the midst of summer, I thought that I would share one of my simpler recipes. It’s something that my mom and grandma do every summer when we have fresh, local strawberries in our area. It’s a way to have a little taste of summer all year long, even on a cold winter day. Wash and cap strawberries. Let strawberries dry, then cut them into bite-size pieces and place in a large bowl. Starting with about a cup of sugar, add sugar to strawberries until desired sweetness is reached. (The more sugar you add, the sweeter they will be.) Stir the sugar until it is dissolved and has formed a syrup over the strawberries. Serve immediately, store in the refrigerator for a few days, or ladle strawberries and syrup into airtight containers and freeze until ready to use. These strawberries are great on toast, as part of a PB&J, or over vanilla ice cream. Also, this recipe works with all kinds of summer berries, as well as other summer fruits, like peaches. Hope you enjoy the dish and Poison Promise. Happy eating—and happy reading! In book eleven of her New York Times bestselling Elemental Assassin series, author Jennifer Estep continues “one of the best urban fantasy series going on the market” (Fresh Fiction).